Forum Index > Makers and Manufacturers Talk > 17th cen "de Gheyn" soldiers helmet For Sale. 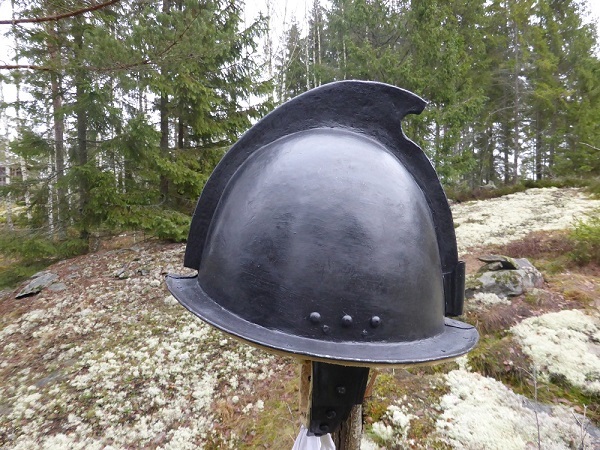 Posted: Sat 23 Mar, 2019 2:15 am Post subject: 17th cen "de Gheyn" soldiers helmet For Sale. Selling a recently made "de Gheyn" soldiers helmet. Its forged in two halves, left with a hammer finish and painted with lineseed oil-paint. Thick buff leather (the real stuff) lining and silk band closure. Based on the detailed depictions of pikemen by Jacob de Gheyn, early 17th cen as well as originals. For a Size XL head. Price 350€.